My friend Amanda from Serenity Now is quite a party-giver! And she's at it again, hosting one of her wonderful "Decorating Dilemmas and Solutions" parties. This one should be especially fun, since it's taking place on Amanda's birthday. White linen drapery panels. Beautiful fabric, yards and yards of it. And just $5.00 per panel. 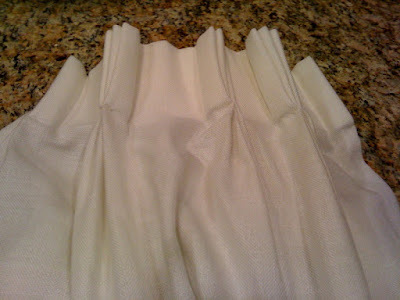 I brought it home, washed it, cut off the drapery pleats, and hemmed the edges with hemming tape. Did you know that you can use chalk to write on terra cotta pots? I can just see these used for an herb garden. . . maybe four of them labeled "Parsley," "Sage," "Rosemary," and "Thyme." I saw this in a magazine--I'm pretty sure it was Country Living--and tried it for myself. It works! The centerpiece for my porch table will include these hydrangeas. They're dried hydrangeas from last year. They had lost their color, so I spray-painted them! Not a bad pick-me-up for free! 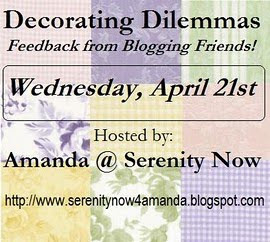 Amanda's party is a great place to share any decorating dilemmas you might have and get feedback from other bloggers. . . or to share any fun decorating solutions you've recently discovered. Visit Amanda to join the fun (or just to say "happy birthday")! I love the terra cotta pots! Great idea! All wonderful ideas, especially spray painting the hydrangeas!! Great ideas! I can see your pots on a picnic table or on a party buffet table. I'm going to try to remember this idea! 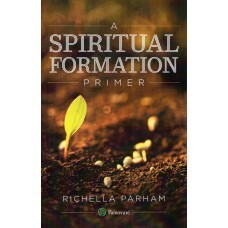 I'm impressed, Richella! I had no idea you could spray paint dried flowers...I would have never known! Good tips. :) Thanks for linking up, friend, and also for the bday wishes! Great solutions! I love the one about the drapery panels. And those pots are so cute with the silverware. Hey Richella! Thanks for stopping by! Is that a new photo on your blog? You look great! I love the chalk on terra cotta pots idea! I happen to have some sitting in my laundry room (no idea why garden pots would be in my laundry room, but- whatever!) and I just bought some plants today on a whim- thanks for the idea! Love the terra cotta pots! Very cute! 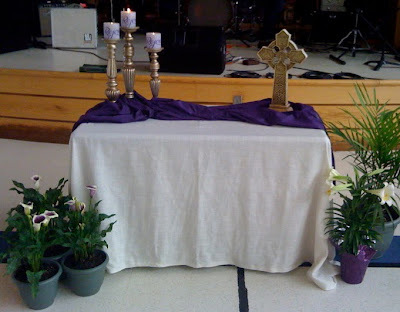 Love your clever tablecloth, and I even like that it's not perfectly pressed for the Easter Altar. I think it was really beautiful! (good thing WE don't need to be perfect to be pressed into service, right?!) I am totally gonna steal your flower pot utensil idea this summer...having a car club bbq at our house. Great solutions! Oh my! Where have I been?? Chalk writes on terra cotta?? You are my hero!! I was a florist for six years-how did I not know about chalk on terra cotta pots! The possibilities.. I am here from Serenity Now. Hi Richella! Great fix on your wedding tablecloth! Tablecloths are SO EXPENSIVE. I find fun linens at Goodwill all the time. Curtains can be used to recover benches too! Great job! Love the little pots as well. I'm going to have to try the chalk idea; never thought of that! My "dilemma" link is not showing up on Amanda's party for some reason so check it out at my blog. I need help with my kitchen! I never thought to spray paint dried flowers - they look great! How cute! I never thought of chalk on terra cotta, but it makes sense. And I would never guess that the hydrangeas are spray-painted...genius! terra cotta and chalk! genius!